Internet marketing is all about the tools and strategies you use. So, are you wondering about the best all in one marketing platform? Do you want to reach out to a large audience within a short period of time? Are you focusing on turning your prospects into long-term customers? Are you looking for a way to integrate all your operations under one platform so as to increase the effectiveness of your marketing campaigns? All the above questions boil down to one thing- a highly reliable marketing automation tool. Over 80% of the most successful blogs and websites make use of automated marketing software to reach out to their audience. In this case, email-marketing tools are very important for creating an effective sales campaign. With the help of automation, 41% of email recipients end up responding positively and even make purchases. This confirms how powerful marketing automation tools can be when it comes to boosting sales. GetResponse has been considered as one of the best marketing automation tools available today. It prides itself in hosting billions of subscribers in its monthly marketing automation program. There are at least 350,000 customers who use GetResponse in over 182 nations globally. Judging from the above figures, it comes out clearly that there is a major impact that GetResponse has in marketing. It is believed that as time passes, this marketing automation tool will reach out to more countries hence more subscribers. So, what makes GetResponse a great choice for internet marketers? GetResponse does not compare with others in the market. It has a handful of unique features that help in email marketing, marketing automation, and even running webinars, all at very pocket-friendly prices. Nowadays people want simple solutions to complex problems; therefore, they love solutions that are easy to use. This is exactly what GetResponse delivers. It can be easily used by both beginners and experts, without the need of hiring extra technical expertise. The drag-and-drop workflow creator enables you to create complex campaigns quickly and with utmost ease. You can also easily track the reactions of your subscribers through its excellent analytics. These enable you to track all relevant campaign metrics. These include the number of purchases, web hits, clicks, opens, and instances of shopping cart abandonment. You have different customization possibilities that can help you design campaigns that are tailor-made for your audience. It has an excellent email creator that is also very easy to use. It creates beautiful emails that look stunning on all devices. You also get access to more than 1,000 images that you can use to further spruce up your emails. 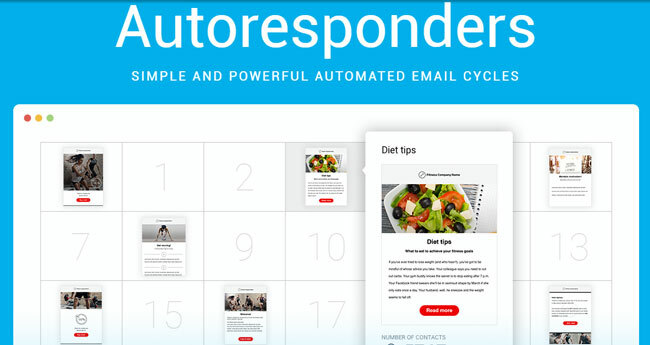 GetResponse has a great autoresponder feature that enables you to create automated emails that you can send to your list. These are excellent for lead nurturing which translates to sales conversion. You also get to see their reactions and monitor their metrics. Instead of sending the same emails to everyone, you can create campaigns and tags that will enable you to segment and send emails to those who are most likely to be engaged. With this tool, it is possible to track all clicks, abandoned carts, and purchases then create specific rules that will trigger different emails depending on actions taken. For instance, you can send emails or even tag the customers to prompt further sales. You can also engage in lead scoring, which is a method of getting the most qualified leads that are expected to easily take specific actions, e.g. making a purchase. It goes without saying that website traffic dictates whether or not your marketing is heading towards the right direction. GetResponse enables you to track the number of people making way to your website through the respective links. You can use this to know the number of people who visited your site, the reason why they visited, and the time they visited. You can also tell the frequency of visits made by a particular person. Not to mention, GetResponse also enables you to know which pages generate the most traffic. Track visits to your ‘thank you’ page and encourage more visits or upsell your products. Develop a reward mechanism that gives scoring points to customers whenever they make purchases. Track the number of carts abandoned and then develop retention mechanisms to avoid bad cases in the future or to even follow up to see if you can still close the sale. Send ‘thank you’ messages to your clients as a way of appreciating their subscriptions and purchases. All this is done to make sure that the relationship you have with your prospects and clients is strengthened. Note that it is through a mutual relationship with customers that progress in Internet marketing and sales is achieved. 89% of internet marketers across the world make use of email marketing, according to Salesforce research. This is evident on how important email marketing is in ensuring success among marketers. It is for this very reason that GetResponse incorporated email marketing tool as a major component. With this tool, the process of creating marketing emails and sending them to prospects is made remarkably easy. You can easily reach out to thousands of subscribers in just a single click with the help of the email marketing tool. The best part is that you will be the one to choose the kind of emails that your clients will receive. You can fully customize your emails and put them in a language that your customers can understand. Users have the privilege of choosing from a wide range of templates and then send them automatically to customers. Things do not end at text emails. GetResponse gives you the chance to choose from a wider range of photos that can be included in emails as a way of enhancing communication. Users have hundreds of photos to choose from. The drag and drop feature enables you to incorporate the photo into the email. With such emails, users are assured of a powerful marketing campaign. 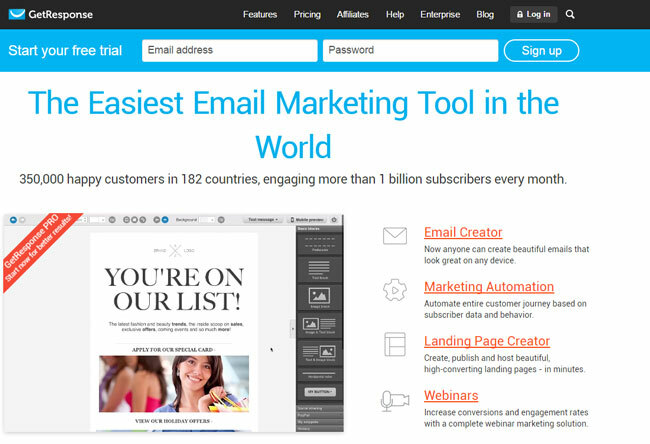 The email-marketing tool allows you to add subscribers from a wider range of sources e.g. websites through web forms and landing pages, social media through form links, and imports of your existing mailing lists on other platforms. If you properly incorporate these, your list will keep growing constantly. Users also enjoy a wide range of integration features that will help increase your reach. This enables you to capture real-time data. This helps you to make important decisions quickly and improve your marketing efforts. This is considered as a very special tool featured by GetResponse. Most email marketing software do not have this feature. Landing pages are great for increasing sales and measuring results. With GetResponse, it becomes possible for you to build excellent, responsive landing pages in a matter of minutes. You will also have the chance to choose from a wide range of customizable templates. There are hundreds of free images that you can use. In fact, you can customize images to match the context of your business. The simple, drag and drop feature makes building landing pages a breeze. Testing helps improve your campaigns and increase your revenues. With GetResponse, you can split test almost anything – including your content, from field, subject line, day of the week, landing pages, web forms, and even time of day. You can use their slider to split your list into testing segments. There is an option of setting it up such that the winning version gets sent automatically. You also get to configure how long you want the test to last. What’s more, you get instant results. How often do you engage with your clients on a one-on-one basis? It is very important to organize a webinar once in a while as a way of building a great relationship with your customers and also ensuring that you boost conversions and sales. Most marketing automation tools do not have this feature, making it one of the outstanding features exclusive to GetResponse. It is easy to think that, being majorly a marketing automation software, GetResponse webinar tool would not be as effective as other stand-alone webinar tools. This is dead wrong because it has all the splendid features needed to conduct phenomenal webinars. These include chat, full screen or partial screen videos, webinar analytics, and recordings. Attendees will not have to download any plugins to join the webinar. They will just simply join the browser-based session in a few clicks. You can also record up to two hours of quality video and send the webinar recording to your subscribers who may have missed it. Email: Starts from $15 per month for up to 500 subscribers. Pro: Starts from $49 per month for up to 5,000 subscribers. Max: Starts from $165 per month for up to 10,000 subscribers. Enterprise: Starts from $799 per month for 100,000 plus subscribers. It is evident that GetResponse is sophisticated, yet very friendly and easy to use. With all those features under one integration, marketing automation becomes a walk in the park. If you use the right strategies, you can get phenomenal results with GetResponse. How Effective are Your Email Campaigns? Thanks for the review. I think that I saw lately some news that GetResponse does also marketing automation. It seems like they can cause some chaos amongst the big players! If ƴou wish forr tօ grow your know-how simply keep visiting this web sitе and be updated with the lateѕt information posteԁ here.